New Delhi, Mar 12: The Congress Tuesday cited a 2010 interview of National Security Advisor Ajit Doval to claim that he blamed the BJP-led government for the release of JeM chief Masood Azhar in the Kandahar hijacking episode and gave a "clean chit" to the terrorist. The scathing attack by the Congress comes a day after the BJP latched on to Rahul Gandhi's reference to the Jaish-e-Mohammad's chief as "Masood Azhar ji". The opposition party had hit back, accusing its rival of deliberately twisting Gandhi's comments made sarcastically. "Modi government's NSA, Ajit Doval, 'spills the beans' and indicts BJP government in the release of the terrorist, Masood Azhar. 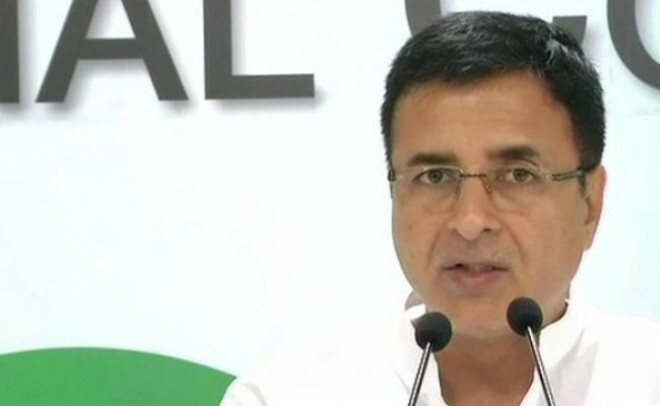 Doval said (in the interview), 'Releasing Masood Azhar was a political decision'," Congress chief spokesperson Randeep Surjewala tweeted. Surjewala also attached a link of Doval's 2010 interview with the tweets. "Modi government's NSA, Ajit Doval's 'clean chit certificate' to terrorist, Masood Azhar revealed," he said. "1. Masood doesn't know how to fabricate an IED. 2. Masood is not a marksman. 3. After releasing Masood, tourism in J&K has gone up by 200%," Surjewala quoted Doval as saying in the interview. Doval saluted the real "nationalistic policy of Congress-UPA to tackle terror, the Congress spokesperson claimed. "UPA-Cong came with a categorical policy on the hijacking. No concession, no talks," he quoted Doval as saying. Why did the BJP government not show the same guts, Surjewala said.